We've got it all - two restaurants, three coffee bars, and a food court that includes Pizza Hut, Boulevard Burgers, Chick-fil-A and Firehouse Subs. Good news! We are now accepting applications for MealSHARE!. Due to the success of the pilot program in Spring 2018, we are launching an ongoing program that will help students in need by providing the ability to eat on campus. Applications for the 2018-2019 school year will stay open until all available funding has been allocated. If you participated in the pilot program you will have to reapply. They cannot be used in the C-store. Dollars are not carried over from day to day and are offered Monday through Friday. You are responsible for the transaction amount over the dining dollars allocated. This program is designed to be discreet and simple. Would you like to support the program? For those who would like to financially support the continuation of the Cavalier MealSHARE program, you can make a donation to the MealSHARE program through the JCCC Foundation. If you have any questions about the Cavalier MealSHARE program, please email Claudia Martin-Ayoade or Jason Arnett, or call 913-469-8500, ext. 3271 to speak to Claudia. 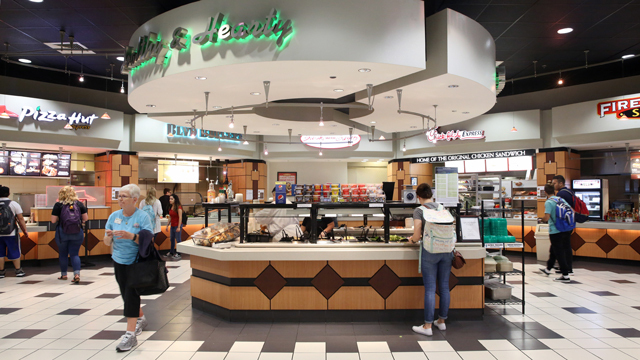 Dining Services has reworked the offerings at two of its restaurants to reflect changing tastes. In response to popular demand, Chef Marwan’s Eastern Mediterranean dishes will now be served in Down Under one week a month. The rest of the month will feature themed weeks like South of the Border and Asian. Also new to Down Under will be build-your-own Asian broth bowls. Some things never change, including JCCC's commitment to environmental stewardship. In all of our restaurants, reusable greenie containers and improved to-go containers are available. And if you bring your own mug to any coffee bar, you'll be rewarded with double punches on your punch card. Experience our award-winning dining options with amazing meals created daily by professional chefs. 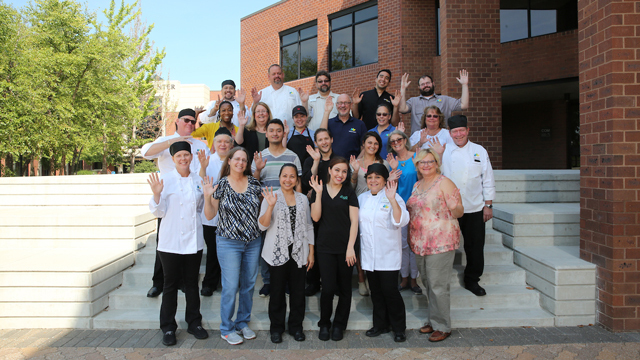 JCCC's exceptional Dining Services department has received 10 awards in 10 years from the National Association of College & University Food Services (NACUFS). We compete against every NACUFS member school large and small.